This latest animation from Kris Hoffman is a collaboration with animal charity Wildlife Aid to illustrate the plight of the British hedgehog. According to the Wildlife Aid Foundation, in the 1950s 30 million hedgehogs could be found in hedgerows and gardens across the UK. That number is now just 1 million. The two minute short features the eponymous Harry emerging from a pile of leaves. He is then encouraged to follow a pair of magical footprints through the perils of his suburban environment back to the countryside. The impossibly cute hedgehog avoids the temptation of an old can of dog food, roads and other obstacles to arrive in a woodland scene where an equally adorable doe-eyed hedgehog is waiting to welcome him. Hoffman is quoted by FormFiftyFive as saying: "The aim was to make it as pretty and charming as we possibly could to get people's attention. How could you not want to look at Harry, when he is so dashing?" The challenge for Hoffman was to take illustrator Sandra Dieckmann's drawings and create the card based environment's Harry travels through. The 2D designs were turned into 3D card and placed into the correct configuration. This meant the trees, walls, bins etc cast shadows, adding to the realism. In post production the drawings were mapped onto the background and married with Prop Designer Joe James’s 3D paper hedgehog puppet. The stop motion animation took five months to create and was shot on a Canon C300 with Zeiss lenses. Adobe After Effects was employed for the comp work. Hoffman explained: "I care about the message of the film and Wildlife Aid's work very much. It's great to see that the animation has the potential to get others to care too and help the charity." Animated feature "Rocks in my Pockets" takes an ironic and often humorous look at sanity, depression and suicide. A labour of love by Latvian filmmaker Signe Baumane, the project took almost four years to complete. According to the film's website the process began with Baumane recording the 90-minute voiceover. The next step was to create storyboards. The illustrator explains: "As an animator you need [the storyboards] to be efficient, but working from a storyboard I feel like a robot - everything has already been decided and you are only to follow the orders. I do enjoy the anxiety of creating something out of nothing and I like improvisation." Next up was the set construction. 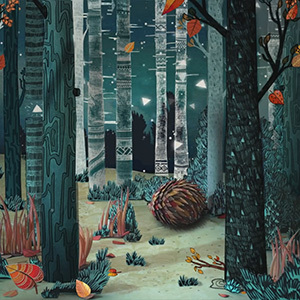 Baumane decided to build 3D sets for her 2D animated characters to inhabit. Photos of the paper-mache sets and stop motion sequences were then printed out and used as a blueprint for the animation. This was all hand drawn, pencil on paper. In total Baumane reckons she created around 30,000 individual drawings. The illustrations were then scanned into Photoshop and imported to Premier for line tests and voiceover synching. Baumane’s Production Manager and Colour Cesigner supervised the colouring of each frame before editor Wendy Cong Zhao composited the work in After Effects. The Quick Time movies were finally transferred to Final Cut Pro where the final film was edited together. Variety said "Rocks in my Pockets [Boasts] a narrative of extraordinary complexity and density, stuffed with irony, humour and tales-within-tales... imaginative... fascinating and very personal." "If You Give a Mouse an iPhone" is a parody of the popular children's classic "If You Give a Mouse a Cookie". Created by writer and illustrator David Milgrim, under the cunning pseudonym Ann Droyd, the tech-savvy animation highlights the perils of our modern-day addiction to smartphones. This cautionary tale features a mouse named Applesauce who is given an iPhone to stop him bothering his busy owner - but just for 10 minutes. However, when the time is up, Applesauce is lost in the phone and oblivious to the pleading voice of his friend and real life adventure he is whisked away on. The story is a perfectly executed warning to all children that being tech-obsessed could mean missing out on the adventures of real life. The illustrations create a weird and wonderful adventure going on all around the iPhone addicted rodent who only eventually realises what has happened when the phone's battery dies and he realises that there is nowhere to charge it on the fabulous desert island he has been transported to. Voiced by former SNL cast member, actor, writer and comedian Fred Armisen, this animated version of Milgrim's book is both a warning to children and to adults about the perils of technology as a distraction from what is going on in the real world. Another cautionary tale has gone viral on the internet. This time the animation warns against the devastating effects of addiction. Created by German animators Film Bilder, "Nuggets" is the five-minute story of a kiwi bird out for a stroll who stumbles upon a golden blob. Intrigued, the adorable character decides to ingest the yellow liquid inside the nugget. His world turns a similar colour and our hero becomes euphoric. The flightless bird even takes to the sky for a brief period before floating back to the ground. He continues his stroll and soon comes across another nugget. After sucking up its dreamy contents the effect is similar to before, but doesn't last quite as long and the kiwi comes back to earth with more of a bump. By now our protagonist is running along in search of more hits, but the ecstasy is beginning to diminish and our kiwi friend is turning into a battered blob himself. 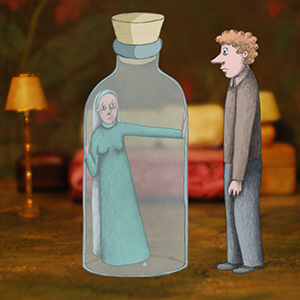 The short animation was written and illustrated by Andreas Hykade. Instead of condemning addiction, the animation reveals the heartbreaking reality of the descent into darkness experienced by many who may have been tempted by that first golden blob of euphoria. Heartbreaking in its simplicity, "Nuggets" is a lesson in how the simplest of line-drawn animations can have a profound impact on an audience. On a lighter note, Gwen Stefani is back with a vibrant mix of live action and animation in her video for the single "Spark The Fire". The promo opens with Stefani floating over a neon cityscape on a cloud. The No Doubt singer is then transported to a nightclub packed with energetic dancers where speech-bubbles and emoji-esque doodles pop in and out of existence. The clip was directed by Sophie Muller - who was also responsible for Stefani's "Baby Don't Lie" video. Speaking to ABC News, Stefani explained: "It's kind of a clash of this punk rock kind of old-school feeling, club feeling, but [with] this really modern emoji world, and it just looks really cool together." The hyper-colourful video also features a pizza printer and the floating, disembodied, heads of collaborator and producer Pharrell Williams.